When the fiercest giant in all of Ireland comes knocking at his door, what can peaceful Fin M'Coul do to escape him? 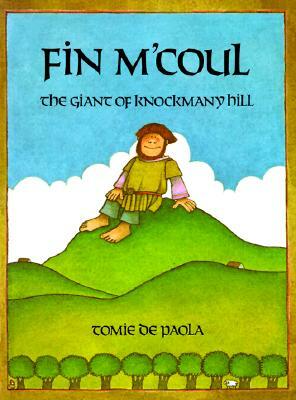 Fin M'Coul lives atop windy Knockmany Hill, and spends his days with the other giants of Ireland, moving huge stones to build a causeway to Scotland. But one morning, he hears a rumor that Cucullin, the strongest giant in the land, is coming to find and fight him. Full of humor and charm, Tomie dePaola's retelling of this classic fable is boldly illustrated, with detailed borders based on ancient Irish metalwork.